By Al Globus and other members of the Lifeboat Foundation Scientific Advisory Board. This is an ongoing program so you may submit suggestions to [email protected]. 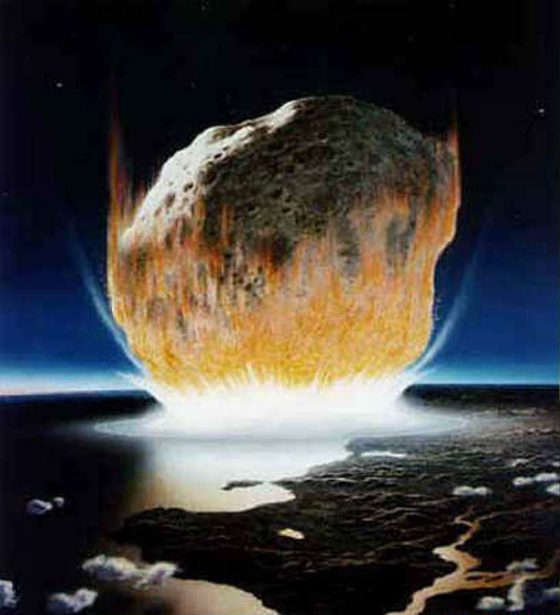 Artwork by Don Davis of large asteroid beginning the destruction of most life on Earth. Courtesy, NASA. Until fairly recently there were no significant efforts to identify asteroids and comets that may impact the Earth. This began to change in 1992 with the Spaceguard Survey Report which in 1994 led the House Committee on Science and Technology to direct NASA to work with the space agencies of other countries to identify and catalogue within 10 years the orbital characteristics of 90% of all comets and asteroids larger than 1 km and in orbits that cross the orbit of Earth. In 2005, the U.S. Congress further tasked NASA to identify 90% of near-Earth objects with a size greater than 140 meters in diameter by the year 2020 and 90% of objects greater than 1 kilometer by the year 2008. This report will conclude with our solutions to the problem of asteroid impacts. If we don’t do something, sooner or later Earth will be hit by an asteroid large enough to kill all or most of us. That includes the plants and animals, not just people. Maybe this won’t happen for millions of years. Maybe in 15 minutes. We don’t know. For example, on 23 March 1989 asteroid 1989FC with the potential impact energy of over 1,000 megatons (roughly the equivalent a thousand of the most powerful nuclear bombs) missed Earth by about six hours . We first saw this fellow after closest approach. If 1989FC had come in six hours later most of us would have been killed with zero warning. It’s unlikely, but a large comet or asteroid could impact the Earth in 15 minutes and eventually we will be be hit, for sure. We are hit by thousands of smaller asteroids every year and we don’t see any of them before the collision. Detection of larger, Earth-threatening rocks is very far from complete. At the present rate it will take years before we find just 90% of them. Beside these inevitable cosmic disasters the long list of potential human-induced potential calamities  nuclear war, ecological collapse, global warming, epidemics, etc.  are less certain and far less dangerous, although much more likely in the near term. After all, the worst of these would probably kill less than three quarters of the people on the planet. A good sized asteroid will get us all. We have been warned. In October of 1990 a very small asteroid struck the Pacific Ocean with a blast about the size of the first atomic bomb; the one that leveled Hiroshima, Japan killing roughly 50,000 people in seconds. If this asteroid had arrived ten hours later it would have struck in the middle of more than a million U.S. and Iraqi soldiers preparing for war. It could have struck near U.S. forces. The U.S. would have thought Iraq attacked with a nuclear weapon. America would have used its immense nuclear arsenal to turn Iraq into a radioactive wasteland, and even one nuclear bomb can ruin your whole day. Hiroshima-sized explosions due to asteroids actually occur in the Earth’s atmosphere about once a month , but are seldom seen because most of the Earth is unpopulated. The data comes from Air Force satellites designed to look for nuclear explosions. Besides, it gets worse. 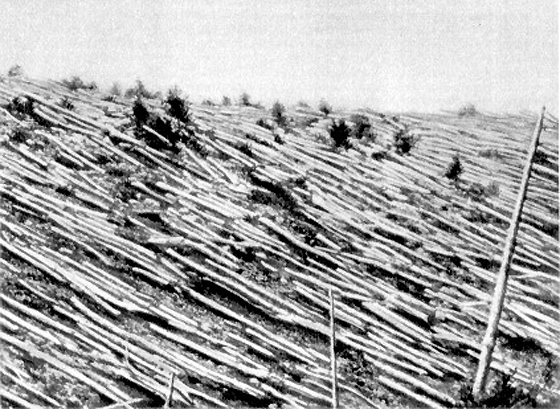 Some of the 60 million flattened trees from the 1908 Tunguska event. 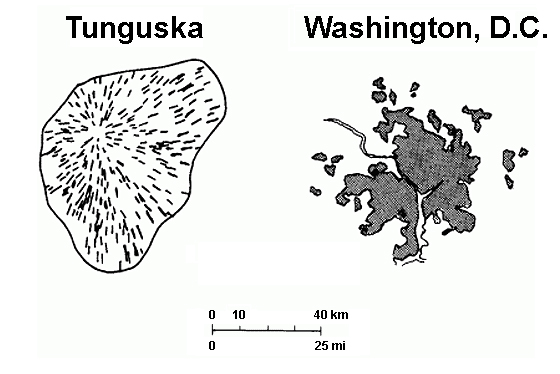 The energy of the Tunguska asteroid impact would have been equivalent to 10 to 40 Megatons of TNT. Had this happened over a populated area it would constitute one of the greatest natural disasters of all time. In 1908 a small asteroid (perhaps 50 meters across) hit Tunguska, Siberia and flattened 60 million trees. That asteroid was so small it never even hit the ground, just exploded in mid-air. If it had arrived four hours and fifty-two minutes later it could have hit St. Petersburg . At the time St. Petersburg was the capital of Russia with a population of a few hundred thousand. The city would have ceased to exist. As it was, dust from the blast lit up the skies of Europe for days. Asteroid strikes this size probably happen about once every hundred years. However, this is just an average. Just because we got hit once doesn’t mean we’re safe for another hundred years. Indeed, there was another Tunguska-class strike in the Brazilian rain forest on 13 August 1930 . But don’t worry, it gets worse. It’s not just Earth. In 1178 our Moon was hit by an asteroid creating 120,000 megatons explosion (about six times the force of Earth’s entire atomic arsenal). The collision dug a 20 km (12 mile) crater. This strike was recorded by a monk in Canterbury, England. We are extremely lucky it didn’t hit us. The moon is a smaller target and has much less gravity to attract an impactor. If a 120,000 megaton blast had hit the Earth our history would have been dramatically different. Catastrophes of this magnitude happen on Earth perhaps once every 1,000 years or so. We’re just lucky the last one hit the Moon instead. There are about 1,000 asteroids a kilometer or more in size that cross Earth’s orbit (the path Earth takes around the Sun). About a third of these will eventually hit Earth  if we don’t do something about it. An asteroid strike this large can be reasonably expected to kill a billion people or so, depending on where it hits. A strike in China or India will kill more, in Antarctica less. Even a strike in the ocean would create a tsunami so enormous most people living near the coast would be drowned. A strike of this size is expected about once every 300,000 years or so. We might as well be playing Russian roulette. Admittedly, the revolver has 300,000 cylinders, but if we keep pulling the trigger long enough we’ll blow our head off, and there’s no guarantee it won’t be the next pull. But don’t worry, it gets worse. The most recent large strike also missed Earth. 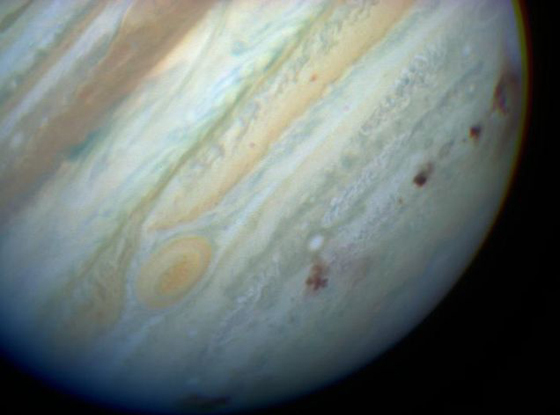 In July 1994, the comet Shoemaker-Levy 9 plowed into Jupiter. The comet broke up into roughly 20 large pieces before contact, but when the pieces hit they left a string of enormous explosions clearly visible to our telescopes. The scale of the destruction was staggering. Each impact was the equivalent of about 10 million megatons of TNT. If Shoemaker-Levy had hit Earth instead of Jupiter, in the extremely unlikely event you were alive you certainly wouldn’t be reading this report. You’d spend every waking moment trying to survive. But don’t worry, it gets worse. Ten Thousand Times the Earth’s Entire Atomic Arsenal Level Impact and it Hit Us! Life 65 million years ago was about to change. Sixty-five million years ago a huge asteroid several kilometers across slammed into the Yucatan Peninsula in Mexico. The explosion was the equivalent of about 200 million megatons of dynamite, about the equivalent of all 20 pieces of Shoemaker-Levy. The blast turned the air around it into plasma  a material so hot electrons are ripped from the atomic nucleus and molecules cannot exist. This is the stuff the Sun is made of. Enormous quantities of red-hot materials were thrown into space, most of which rained down worldwide burning literally the entire planet to a crisp. Anything not underground or underwater was killed. Evidence gathered by the University of Colorado at Boulder suggests that all the dinosaurs above ground were incinerated in a few hours reference. Surprisingly, only about 75% of the plant and animal species on Earth were exterminated. What’s surprising is that everything wasn’t wiped out. This scenario has been repeated over and over, perhaps once every 100 million years or so. Each collision killed up to 95% of all species on Earth. 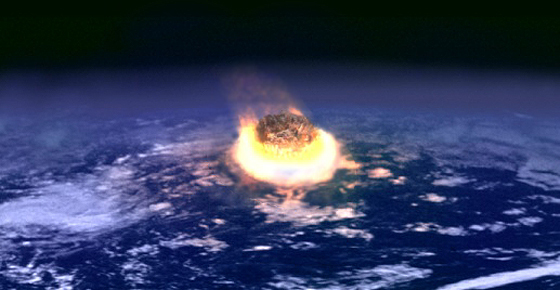 As many as two-thirds of all species that ever existed may have been terminated by asteroids hitting the Earth. Just because an asteroid misses land does not mean it won’t be deadly. 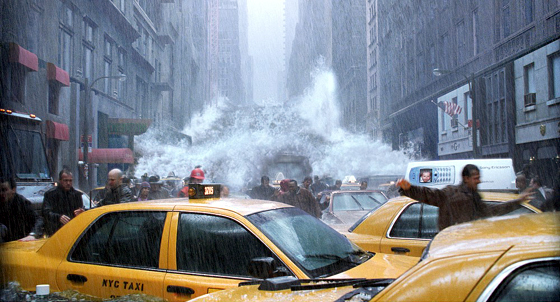 Courtesy, Twentieth Century Fox from the movie The Day After Tomorrow. We know about the asteroid that killed the dinosaurs because we found the crater. But what happens when an asteroid hits the ocean? After all, oceans cover two-thirds of the Earth’s surface. Most asteroid strikes must be in water. Unless the asteroid is very large there won’t be a crater. However, if you drop a rock into a lake it makes a wave. The larger the rock the bigger the wave. Drop a 400 meter (three football fields) diameter asteroid into the Atlantic Ocean and you get a tsunami 60 meters (yards) high . Do that today and beach side property values will plummet due to the sudden and complete absence of any people or buildings. Almost every human culture has a flood story (for example, Noah’s Ark). These may be the living memory of asteroids hitting the oceans. This is not idle speculation, there are several hundred thousand asteroids in near Earth orbits large enough to cause world-wide casualties by creating tsunamis . Of course, if the asteroid is big enough, even a hit in the ocean will rearrange the Earth’s crust. Researchers from the University of Toronto and the Geological Survey of Canada determined that an asteroid the size of Mt. Everest probably hit the Earth about 1.8 billion years ago, and literally turned part of the Earth inside out . The crater is about 250 kilometers (156 miles) wide. It’s amazing that anything survived at all, but somehow a few of our single-celled ancestors lived through the ensuing hell. Life started on Earth over 3 billion years ago, but no large animals appeared until about 700 million years ago  perhaps because of the devastating bombardment Earth was still suffering through. These are just a small sampling of the cosmic threats to Earth. We are living in an orbital shooting gallery. There are lot of objects out there and, someday, many of them are going to hit something  the Sun, another planet, or Earth (some will also be ejected from the solar system). Of the known near earth asteroids, between 25 and 875 large objects will hit the Earth causing global devastation and another 400 to 6250 smaller objects will strike the Earth’s oceans causing tsunamis devastating coastal regions . We just don’t know when. We don’t know if the next strike will be in five minutes or 50 million years, but we do know it will happen. It’s just a matter of time. Only mankind can end this threat. If we don’t do it, no one else will. No one else can. Fortunately, we are starting to pay attention. The first step is to simply find the dangerous asteroids and comets. NASA has a program to locate potential Earth killing asteroids  those more than a kilometer (a bit more than half a mile) across and hopes to identify 90% of them by 2008 . If one of the unfound has our number on it, it’s not only Houston that will have a problem. Even an asteroid only a couple hundred meters (yards) across may, if it hit the Atlantic Ocean, create a wave that would completely wash over Florida, making it irrelevant in the next Presidential election. In 2005, Congress also assigned NASA the task of detecting 90% of near-Earth objects with a size greater than 140 meters in diameter by the year 2020 . Apophis Path of Risk (PoR); the locus of points on the Earth’s surface where Apophis could impact, if it were to impact the planet on April 13, 2036. Note that the PoR extends almost 270 degrees around the Earth’s surface. We have found hundreds of kilometer-sized Earth orbit-crossing asteroids and determined their orbits well enough to know that these, at least, pose no threat in the immediate future, although one does have a small chance of getting us in 2036. If we took this particular threat seriously, we would have time to divert it. In principle, such an asteroid can be given just a little shove and will then miss Earth. While we’re not sure of the best way to do this, if we knew a collision was coming one can be confident that every scientist and engineer on the planet would be bent to the task. Funding would not be a problem. The goal is to first detect the asteroid and then to alter its orbit . If you attempt to destroy an asteroid as they often do in Hollywood movies, you will likely change the situation from a single impact situation to a many impact situation. There are many proposed methods under consideration for detecting asteroids and altering their orbits. We support our Scientific Advisory Board member Nick Kaiser’s efforts to locate any asteroids that may impact the Earth. He is principal investigator of the $50 million Panoramic Survey Telescope & Rapid Response System (Pan-STARRS) asteroid early-warning system. 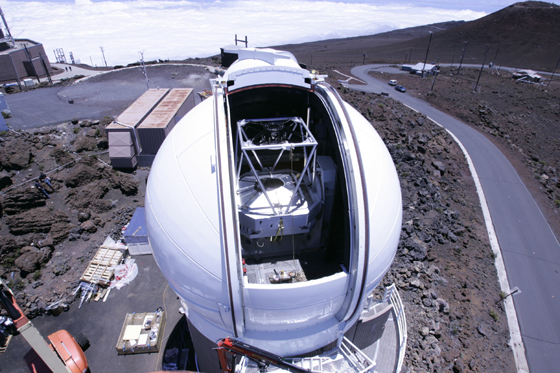 The under construction PS1 telescope, part of the Pan-STARRS asteroid early-warning system. Schematic diagrams of the 1.4 gigapixel camera to be installed in PS1 in mid 2007. Each of the 60 black squares in the center of the camera is an Orthogonal Transfer Array (OTA) consisting of 64 individual 600 x 600 CCD devices. Currently, it is difficult to detect asteroids approaching on the “blind spot” caused by the glare of our sun, and this limitation can best be solved by the creation of extraterrestrial telescopes sufficiently removed from Earth to change their vantage point . (Asteroids are relatively small and dark so you want as clear of a view as possible of them.) 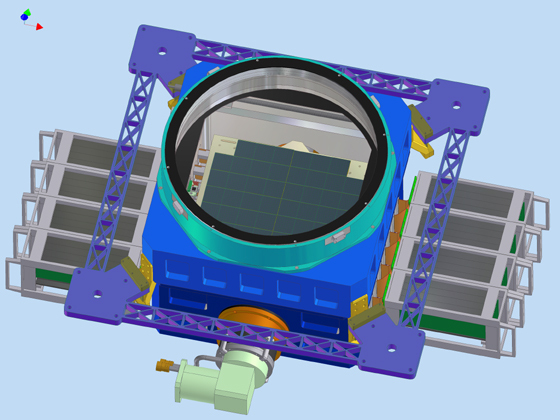 We recommend that such space based telescopes be built and deployed. We support the proposal by the B612 Foundation to significantly alter the orbit of an asteroid in a controlled manner by 2015. They propose use of the gravity deflection approach, where you station a spacecraft a short distance from the asteroid, and use the gravitational attraction between spacecraft and asteroid to pull the asteroid off course. This method would be less likely to break up an asteroid than alternative methods since there would be no physical contact with the asteroid. You do not want the asteroid to break into multiple pieces as you will then have multiple problems instead of one problem . Also note that a large asteroid could be blown apart by a nuclear device detonated in its core only to have gravity draw the asteroid back together, essentially nullifying the effect of the explosion. 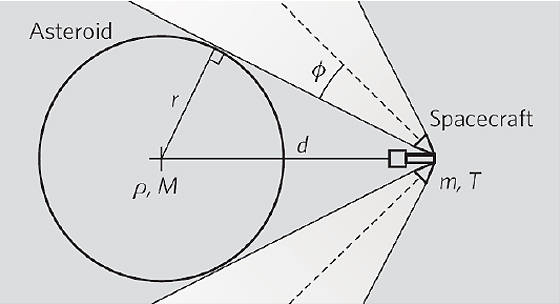 The schematic geometry of a Gravity Tugboat proposed by the B612 Foundation that is towing an asteroid. If the distance d between the centers of gravity of the asteroid and GT is equal to 1.5 r and the half-plume angle ø is assumed to be 20 degrees the engines will each have to be canted outward by 60 degrees and each will have to produce thrust equal to the towing force. Setting up “mass drivers” on the object to scoop up dusty material and shoot it away, giving the object a slow, steady nudge. Flying a big sheet of reflective aluminized PET film to wrap itself around the asteroid, acting as a “solar sail” to use the pressure of sunlight to shift the object’s orbit. Dusting the asteroid with titanium dioxide should have the same effect. Attaching an actual solar sail to the asteroid would work faster than these solutions, especially if the solar sail was hundreds of kilometers across. A large solar sail would be nontrivial to build. Dusting the object with powdered chalk or soot to perform a similar adjustment, utilizing the Yarkovsky effect. Have a spacecraft dock with the asteroid and then use its engines to alter the trajectory of the asteroid. This would be difficult if the asteroid was rotating quickly or was a “rubble pile”. Directly altering its momentum by sending a spacecraft to collide with the asteroid. Detonating a series of smaller nuclear devices alongside the asteroid, far enough away as to not fracture the object. This form of nuclear pulse propulsion would alter the asteroid’s course and hopefully not turn it into many asteroids. Attach an engine to it and then break it up by spin up. This involves spinning the asteroid so fast it breaks up sending fragments flying off into the solar system, hopefully not headed towards Earth any more. Consume the threat for profit. Now we’re talking. This is our favorite solution although it is more complicated than simply nudging an asteroid a little. The smallish near-Earth asteroid (3554 Amun) contains metals worth about $20 trillion (that’s not a misprint, it’s trillion with a ‘tr’) at today’s prices . Carl Sagan, in his book Pale Blue Dot, expressed concerns about deflection technology: that any method capable of deflecting impactors away from Earth could also be abused to divert non-threatening bodies toward the planet. Considering the history of genocidal political leaders and the possibility of the bureaucratic obscuring of any such project’s true goals to most of its scientific participants, he judged the Earth at greater risk from a man-made impact than a natural one. Sagan instead suggested that deflection technology should only be developed in an actual emergency situation. We share Sagan’s concerns and believe more effort should be put into detecting asteroids than deflecting asteroids. Asteroid impacts are a concern and Hiroshima level impacts occur about once a month but do not make the news because they have missed populated areas so far. We support efforts to locate asteroids that may impact Earth including our Scientific Advisory Board member Nick Kaiser’s efforts to locate dangers with the Panoramic Survey Telescope & Rapid Response System (Pan-STARRS) asteroid early-warning system. The worst way to deflect an asteroid is to attempt to destroy it. Not only would this potentially cause the Earth to be hit by multiple impactors instead of one, but it would waste a good source of space habitat materials. We prefer use of the gravity deflection approach, where a spacecraft is stationed a short distance from the asteroid, and uses the gravitational attraction between spacecraft and asteroid to pull the asteroid off course. The Increasing Recognition of Near-Earth-Objects (NEOs), Space Manufacturing 10: Pathways to the High Frontier, Proceedings of the Twelfth SSI-Princeton Conference, 4–7 May 1995, edited by Barbara Faughnan, AIAA. J. S. Lewis, Mining the Sky: Untold Riches from the Asteroids, Comets, and Planets, Helix Books, Addison-Wesley Publishing Company, Inc.
J. S. Lewis, Rain of Iron and Ice, The Very Real threat of Comet and Asteroid Bombardment, Helix Books, Addison-Wesley Publishing Company, Inc.
Allan J. Willoughby and Melissa L. McGuire (1995), Adroitly Avoiding Asteroids! Clobber, Coax or Consume?, Space Manufacturing 10, Pathways to the High Frontier, Proceedings of the Twelfth SSI-Princeton Conference, 4–7 May 1995, edited by Barbara Faughnan, AIAA, pages 103–113. University of Toronto, Meteorite crash turned Earth inside out: study, June 4, 2004. NASA, A Study to Determine the Feasibility of Extending the Search for Near- Earth Objects to Smaller Limiting Diameters, 2003. NASA, The Threat to Earth from Asteroids & Comets, 2006. Leonard David, SPACE.com, Supercomputer takes on cosmic threat, June 14, 2006. John G. Cramer, Analog, Killer Asteroids and You, July 1992. Robert Roy Britt, SPACE.com, Asteroid Buzzes Earth, Highlighting Cosmic Blind Spot, March 19, 2002. Watch a Japanese simulation of what a meteorite collision would look like! Look at impacts in Africa, Asia, Australia, Europe, North America, and South America. Here’s a 300 km diameter crater! Apophis Mission Design Competition by The Planetary Society. Plans to put an electronic tag on Apophis, a 300-meter diameter asteroid. The Torino Impact Hazard Scale. Why Build Orbital Space Colonies? by Al Globus – ongoing project. 20 Things You Didn’t Know About… Meteors by LeeAundra Temescu, Discover Magazine, 2006. Are mirrors the best way to deflect asteroids? by David Shiga, NewScientist – October 9, 2007. Asteroid Hunters Receive Grants by Edwin L. Aguirre, Sky & Telescope, 2003. Flying Rubble by Jeffrey Winters, Discover Magazine, 1996. Hunting Asteroids From Your Backyard: A convergence of technology has opened the realm of asteroid discovery to virtually any backyard observer. by Dennis di Cicco, Sky & Telescope, 1996. New Cosmic Defense Idea: Fight Asteroids with Asteroids by Robert Roy Britt, SPACE.com – June 20, 2006. Technical Critique of NASA’s Report to Congress and associated of “2006 Near-Earth Object Survey and Deflection Study: Final Report” by Russell L. Schweickart, Chairman, B612 Foundation and Chairman, Association of Space Explorers Committee on NEOs – December 28, 2006. The End is Near: The remarkable journey of a tough little space probe to the place where killer asteroids lurk by Kathy A. Svitil, Discover Magazine, 2001. Last Days on Earth, History Channel documentary about potential asteroid collisions, 2007. Asteroid Impact by Doug Henderson, Dial Publishing – 2000. Asteroids: A History by Curtis Peebles, Smithsonian – 2001. Death By Black Hole: And Other Cosmic Quandaries by Neil deGrasse Tyson, New York: W. W. Norton – 2007. Hazards Due to Comets and Asteroids by Tom Gehrels, Mildred Shapley Matthews, A. M. Schumann, University of Arizona Press – 1994. If an Asteroid Hit Earth by Ray Spangenburg and Kit Moser, Franklin Watts Press – 2000. Mining the Sky: Untold Riches from the Asteroids, Comets, and Planets by J. S. Lewis, Helix Books, Addison-Wesley Publishing Company, Inc. – 1997. Rain of Iron and Ice, The Very Real threat of Comet and Asteroid Bombardment by J. S. Lewis, Helix Books, Addison-Wesley Publishing Company, Inc. – 1997.